My son and I bottled the Festa Brew West Coast IPA last Saturday. Everything went very well. We didn't quite get as much as other brews. I'm very anxious to try this one. The aroma makes my mouth water. During the bottling process, we also learned something new. We didn't use enough corn sugar for the carbonation of the Wheat. 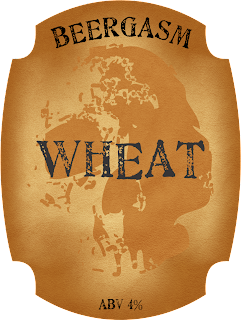 Don't get me wrong; the wheat tastes pretty good, but it seems to be lacking a little something that I couldn't quite put my finger on. While I was calculation the quantity of corn sugar to prime the IPA, I discovered that I used the wrong calculation for the wheat. The quantity we used was at least 50g short. Oops. I won't make the mistake the next time. Aside from the carbonation, would that have made a difference to the flavour? I don't know, but I'll find out the next time I make it. With 4 weeks to go until Christmas, I'd like to get at least one, maybe two, more batches of something ready for the Christmas season. I was hoping to make Festa Brew's Double Oatmeal Stout and Red Ale. I stopped by DeFalco's on Gladstone yesterday and picked up the stout. Sadly, they didn't have the Red Ale in stock. All they had was the West Coast IPA (lots of it! 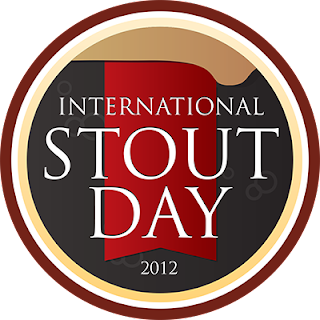 ), the stout, Pale Ale, Wheat, and Blonde Lager. I might have to drive out to the Orleans location and see what they have. I blogged about these guys last week. They go live on November 28th at 1pm. You can get more details on their web site by clicking -> here. No? Then these guys could hook you up: Brew Donkey. For $12 (plus cost of the beer) you could organize a pretty decent beer tasting event and not even have to leave your home! I've been toying with label designs lately. And name changes for my home "brand". Here's an early sample of one of the designs. The skull isn't a definite, but I like it because it's somewhat subtle and goes well with the old look and feel of the label. My wife didn't even pick up on the fact that it was a skull until I pointed it out. That's sort of what I was going for. The old look and feel will most likely stay. It goes well with a swing top bottle. I can easily change the style of beer on the label and keep them all consistent. I wanted to incorporate some kind of colour that visually identifies the style, but so far I can't find anything that works well with the rest of the label. The name "beergasm" was an afterthought moments before I uploaded it, since it's the name of my blog. As much as I liked "Billy Rigg", it doesn't feel enough like me. Another option is going with my last name: Paterson. My son and I bottled the Festa Brew wheat on Saturday. We had a little bit of a hiccup when we started actually transferring it to the bottles. I decided we should try using a hose from my old kit. The hose is a little wider than the one that came with the new kit, so it fits onto the transfer and bottling rods with less effort. As the first bottle filled, the beer in the hose began to foam. A lot. And the foam transferred to the beer. I blamed the hose, so we swapped it to the narrower hose thinking it would fix the problem. It didn't. As it turns out, the hose wasn't the problem. It just had too much air in it to begin with, and once it was gone it was fine. We didn't have that problem with the pale ale or bock. Strange. Again, we had difficulty getting an accurate gravity reading, so the alcohol content is a big estimate and should be around 4%. I wasn't planning on starting another batch of anything until my beer "stock" drops, but yesterday I noticed an old post on DeFalco's Facebook page saying that they got a shipment of Festa Brews in, including the "limited" West Coast Pale Ale that I've been looking for. I was posted days after my last visit there. I stopped off yesterday after work to see if they had any left and I was surprised to see that they had a lot of them. At first it looked like that's all they had on the skid. Because it's a "brewmaster's reserve" it did cost more than any others I've tried to date, at $40.99. The bock was $31.99 and the pale ale was less than that. 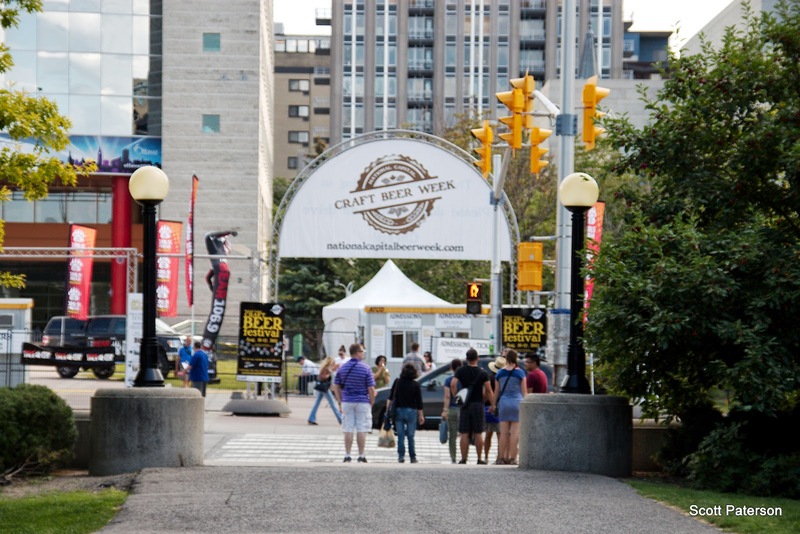 National Capital Craft Beer Week has announced that the WinterBrewed 2014 dates are February 14-16. 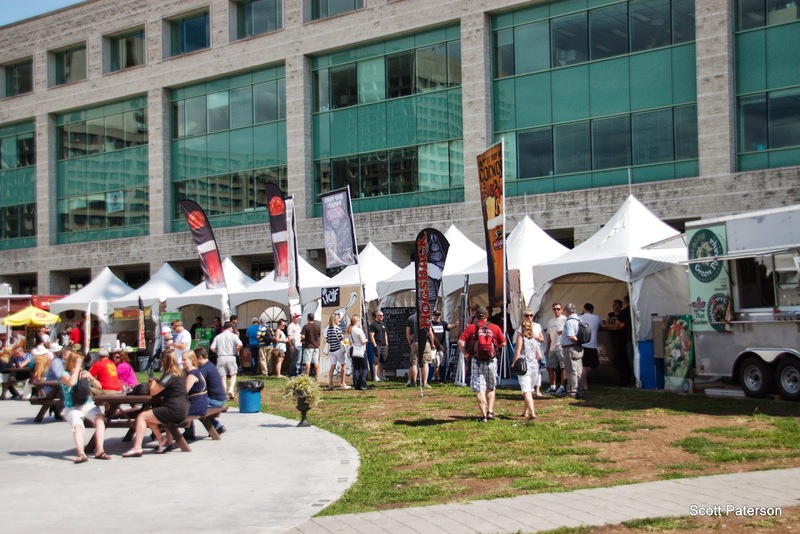 This year's location will be at Ottawa City Hall, where the National Capital Craft Beer Festival was held this past summer. Further details have yet to be announced. I just realized that I never did any "official" review of my own home brewed, Festa Brew Pale Ale. So here goes. First, a rundown of what we did. I think it tasted best after 3-4 weeks of aging in the bottles. The colour was a slightly cloudy copper with an off-white head that lingered. The aroma was a little spicy with some nuttiness. Perhaps a hint of citrus orange.. or some kind of fruit. The taste was.. vegetal? I can't describe it any different. I'm not sure if I've ever taste a beer like it yet. The ABV was around 5.2%, if I calculated correctly. That makes it a pretty decent session beer in my books. Something else I noticed (and maybe I imagined it) but it tasted better from the 750ml swing-top bottles, than it did from the 500ml PET bottles. Overall, I really enjoyed it and I'll definitely be making it again in the future. I'd like to experiment a little with it and let it sit longer for the secondary fermentation to see how it affects (improves?) the flavour. I picked this up on Friday at my local LCBO along with a few other new and tasty beverages. I think this was one of my favourites if the weekend. Red on Red is a limited edition Imperial Double Red collaboration ale between Flying Monkeys and Central City Brewers. Its colour is a dark ruby red, with a light brown lingering head. The aroma is grapefruity, that reminds me a lot of other Flying Monkeys beers. The taste is, again, grapefruit with a light lingering bitterness that remind me of.. eating grapefruit at breakfast. This Limited Edition Double Red Ale has been single-hopped using the first release of the brand new “Mosaic” hops bringing out floral notes of Papaya and Guava, creating a unique flavour and aroma when married with the Pale, Munich and Three Crystal malts. If I could remember what papaya and guava tasted like, perhaps I would have picked up on that. :) I think I need to pick some up and train my taste buds a little. Overall, I loved it, and I'd definitely buy it again. It's not too bitter like some IPAs, which makes it very easy drinking for me. But at 9.5% ABV, I'd have to limit myself to a bottle. I opened a Cafepress store a while ago for a few beer-related T-shirt designs. I ordered one of my favourite ones about a week ago and it arrived last week. Last Saturday, my son and I bottled the bock. We got 28 500ml PET, 12 500ml swing-top, 3 750ml swing-top, and one 1L swing-top filled up. I'm going to crack one open tomorrow and see how it's doing. At the same time, we started a wheat beer, which we racked this evening. We've already got plenty of bottles for it even if none of the bock get drank. Ya... that's likely. :) I was a little surprised to find a few fruit flies buzzing around the primary fermentation pail last night, and a little worried that it might get contaminated. It should have been sealed enough. When we were racking it this evening, my son found one dead fruit fly stuck to the inside of the pail. :( I think it'll be fine. I hope so anyway. One thing that I noticed about the wheat brew was that the initial fermentation foam was pretty much all gone by day 3. The pale ale and the bock still had foam on day 3. The pale ale is now almost all gone. I'll definitely be making it again in the future. I have a 1L bottle left, that I've reserved for a friend who is moving into the neighbourhood, and two 500ml PET bottles that I plan to age 6 and 12 months respectively to see how the flavour changes. A great video on the history of lager, and more. I did, however, decide to crack open one of the pale ale home brews to see what it's like on the third week since bottling. I'm not sure if it's better than week two, but it is still a very tasty beer and one that I will definitely brew again in the future. Something I noticed about bottles is that it seems the 750ml glass swing-top bottles I used have more carbonation in them than the plastic 500ml bottles. The same goes for the 1L bottles. However, I also noticed that one plastic bottle may have a little less or more carbonation than another. Maybe some weren't closed as tight? There just doesn't seem to be as much foamy head as from the glass bottles. I picked up two dozen 500ml swing-top bottles the other week so when I started using them for the Bock, I'll be able to do a side-by-side comparison with the 500ml plastic bottles. Speaking of the Bock. Bottling day was supposed to be Friday, but I decided to let it sit for an extra week before bottling. That's probably a good thing anyway since the health issue would have gotten in the way a little. Apparently this should help to bring out more flavour. Who knows... I don't really have anything to compare it to since this is the first Bock for me. Yesterday I built two new beer crates, specifically for the the swing-top bottles. As an added bonus, the size will also suit wine bottles. They cost around $20 each to build. I need to find a cheaper source of wood for any future crates. A quick update about the Festa Brew "Basement" Bock. My son and I did in fact begin brewing it on Saturday, September 28th and we racked it on Wednesday, October 2nd. I tasted the sample that we drew for the gravity reading and it was pretty tasteless. Or my palette was really messed up. :) The reading was 1.028-1.030. It was difficult to read. Based on the usual schedule this is one is probably due for bottling on Friday or Saturday, but I might let it sit for an extra week before bottling. I built two wooden crates on the weekend. I designed them a little taller than the PET bottles because I'm hoping that they'll also be good for the glass swing-top bottles that I will eventually buy. Iron Maiden Trooper Ale - It's coming! Back in March, I asked the LCBO on Facebook if they had plans to get the Iron Maiden Trooper Ale. I received a response the same day saying they were in talks with some agents, but nothing was firm, and once something was confirmed they would let me know. I received a message this morning telling me that it's in and will be rolled out for wider distribution later this week. That's all kinds of awesome; awesome that they've now got it, and awesome that they didn't forget to follow up. Success. Patience does indeed carbonate beer. I tried one mid-week last week and it had fairly decent carbonation and good flavour. I tried another (or three) on Friday and they were even better. It's hard not to want to have more, but I'm trying to leave time in between tastings so if there's any difference it'll stand out more. I'm hoping that I can save two bottles and let them age for at least 6 months, maybe even a year, and see how they improve. If there's one thing you have to do if you go there, it's make sure you buy the tickets that include bus fair. It's well worth the extra cost because there were so many different beers there to try and you don't want to be driving. Or, find someone who doesn't like beer to be your designated driver. Or, camp there. I didn't realize they had space for camping. Beer tokens were $5 each. 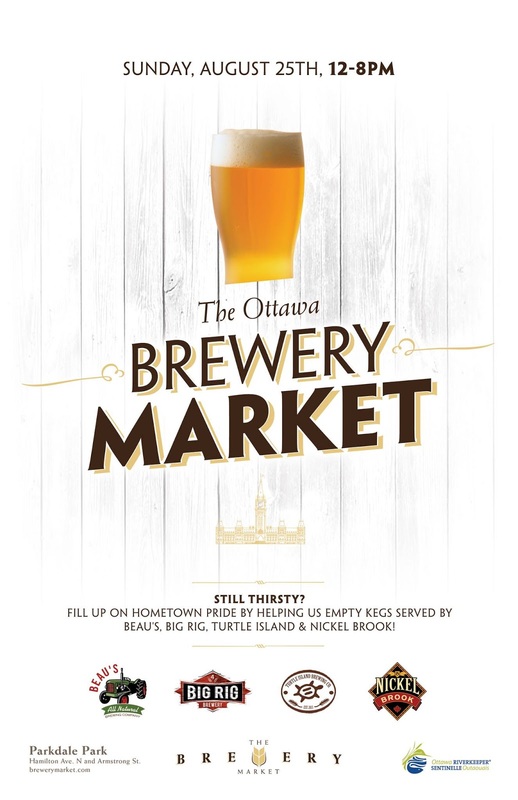 They had 4 large beer tents where they had 3 or 4 different flavours and/or styles of Beau's own creations where 1 token got you an 8oz cup, and one craft tent where they had 50-60 beers from Beau's and many other craft breweries. At this tent, you could get two 4oz samples for a single token. A little pricey I think, compared to LCBO prices. I'm sure there were others that I forgot about. I think our favourite was the Tom Green Beer, which was also my first milk stout. The food was pretty good. The only disappointment was The Works burger. Not very flavourful and the patty seemed rather small. Maybe I should have paid extra for the bacon. I've eaten at The Works many times in the past and they're always been awesome. My wife bought perogie poutine with sausage (from the Barley Mow?). We'll have to try making those at home some time. Later in the afternoon we bought a reuben from Olivea. It was delicious. I'll put up some photos here soon. All good things must come to an end, and beer festivals are no exception. My wife and I hit the National Capital Craft Beer Fest on Friday afternoon, and Saturday evening. After spending a couple of hours there on Friday, I wondered if it was really worth it to get the 2-day pass. If trying as many beer samples is your goal, then the answer is yes. Not just from a standpoint of not wanting to get drunk, but we discovered that some beers aren't available both days. Aside from running out, new ones may appear the next day. More on that in a bit. Now, a little gripe. The web site says "Prices for products will vary from exhibitor to exhibitor, but generally beer is priced at a minimum one token per 4 oz serving and 2 tokens per 8 ounce serving." That's a pretty good deal. I mean, you're trying to get people to try your beers so keep the prices reasonable and expand your customer base. Sadly, this was not the case. There were a few that only charged 1 per 4 oz, but on average it was 2 for a 4 oz, 4 for an 8 oz. That's a pretty pricey beer for something you may not like. However, some had deals where you could get 8 oz for 3 tokens so it took a little of the sting away. Anyway, onto the beer tasting. My wife and I tried 20 beers. A few we had tried before, but we wanted a drink to go along with our lunch that we bought there. Although all were great, any with an * were some of our favs. This had a very strong orange flavour to it. Strongest orange flavoured beer I've ever tried. I like it. This was not only the most expensive sample (4 tickets for 4 oz, "due to the high alcohol content"), it was also likely the strongest maple flavoured beer I've ever tried. Strong, but not overpowering. We tried this one on Friday afternoon and it was not available when we went on Saturday night. I guess they ran out at some point, so this is a good example of why a 2-day pass is handy. It was replaced on their board by Wild Patty's Crazy Berry. Smokey. Not the smokiest beer I've ever tasted, but definitely memorable. My wife didn't like it at all. She said it was like drinking a smoked sausage. A sour beer! Not the most sour I've tasted, but there was no denying it was sour. Food! 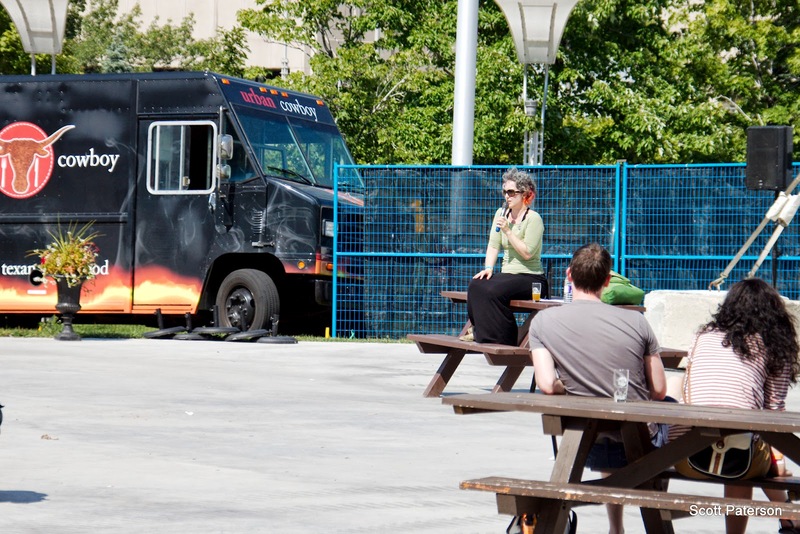 We grabbed a sausage and a poutine with beer gravy from Spuds on Friday afternoon. The gravy was amazing. The sausage was delicious. I think it was one of the cheaper food vendors there too. We were there for the two guest speakers on Friday, but to be honest we didn't pay much attention to everything they had to say because we were too distracted walking around tasting beers. :) They were Mirella Amato (beer specialist and Canada's female Certified Cicerone) and Ian Coutts (author of Brew North) I'm like a kid in a candy story. Perhaps next year I'll take more time to sit and listen. We did catch some of the entertainment on Saturday night by the New Country Rehab. They're a country, rock, bluegrass, jazz band from Toronto. Definitely worth a listen. I picked up a couple of souvenirs from the event: a T-shirt from Flying Monkeys, and a glass from Beau's and Ashton Brewing for my collection. If you've never been to a beer fest, and you're not into lineups and crowds, go during the day. When we went Friday afternoon you could literally walk up to any of the brewery stands and and get what you wanted within seconds. On Saturday night, most of the stands had lineups anywhere from 10-20 people long. Granted, they moved fast so you didn't have to wait very long, but it's something to keep in mind. Overall, a fun time, but a little expensive (spent $60 on tickets alone).